Two weeks ago, the Colorado Buffaloes were undefeated and riding the high of a five-game winning streak. After falling to No. 15 Washington, 27-13 Saturday, the Buffs (5-2, 2-2) have now lost back-to-back games in the PAC 12, and are likely feeling relieved to return home to Boulder. Including Saturday’s 14 point loss to the Huskies, CU has now lost 29 consecutive road games against ranked opponents. Luckily for Colorado though, next week will bring a struggling Oregon State team to town. Playing without star wide receiver Laviska Shenault Jr., who was announced as inactive just hours before kickoff, CU’s offense was severely limited Saturday afternoon. The Buffs had plenty of opportunities to take control of the game, but without its most versatile skill player, CU struggled to finish drives. Even without Shenault, Colorado did a great job of controlling the ball on offense early. The offense certainly benefited from a solid defensive performance, but the Buffs were the first ones on the board. Six minutes into the first quarter, quarterback Steven Montez connected with true freshman wide receiver Daniel Arias for a 37-yard score. It was the first time that Arias was targeted on the season, and it was his only catch in the game. It also ended up being CU’s only scoring play in the loss. Montez finished 17-of-28 for 144 passing yards. The veteran quarterback had one touchdown and one interception as he struggled to get much of anything going against a pesky Huskies defense. Washington’s offense was also limited by injuries. 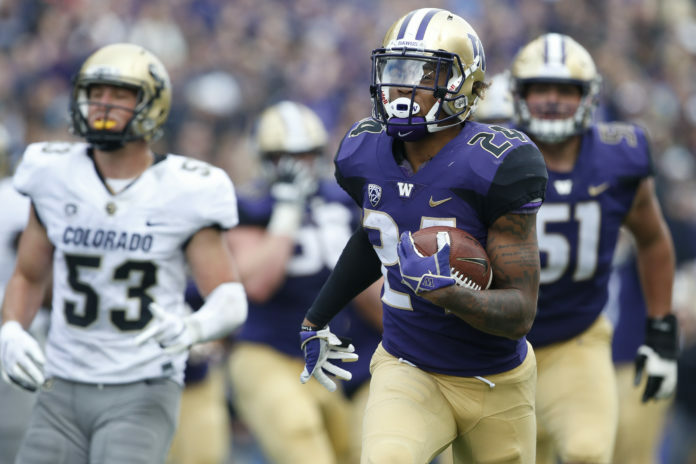 Running back Myles Gaskin missed the home game with a lingering shoulder injury, and quarterback Jake Browning failed to get the passing offense going. Despite being without its leading rusher though, the Huskies offense thrived by using a mix of multiple guys. Filling in for the team’s star back, Salvon Ahmed finished with nine carries for 73 yards and one touchdown, Sean McGrew added 12 carries for 58 yards and Kamari Pleasant had 10 carries for 35 yards and one touchdown as well. Even after his slow start, Browning was surgical with the game on the line. On 4th and 5, Browning made the biggest play of the afternoon, connecting with Aaron Fuller for a 26-yard touchdown. The scoring play proved to be the final nail in CU’s coffin. The Buffs will look to bounce back from a disappointing road trip against Oregon State next Saturday. Kickoff is scheduled for 1:00 p.m.